#3rdfor3rd: Who Cloned the President?. Third grader Jamie shares his review of this mystery series. 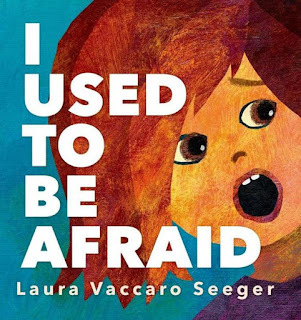 I Used to be Afraid (2014) by Laura Vaccaro Seeger. I believe Green was the first cut-out book I read by Laura Vaccaro Seeger, and I was fascinated by how she used cut-out designs that changed color and meaning on each page flip. That same idea is repeated in I Used to be Afraid but with less interesting results. I'm also not sure what to make of some of the "solutions" to not being afraid (like, she used to be afraid of making spelling mistakes but now she can spell mistake correctly so she isn't?). I guess this is a book where I was hoping for more. Chocolate Me! 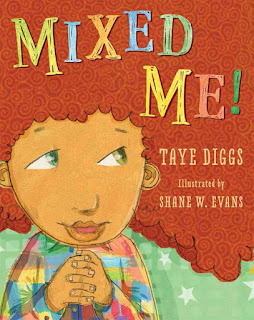 (2011) and Mixed Me! 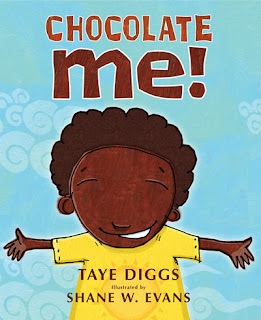 (2015) by Taye Diggs and illustrated by Shane W. Evans. These are two books that also left me hoping for more. I understand that the message is feeling confident in yourself even when people don't understand you or ask you ignorant questions, but the "solutions" seem a bit simplistic - bribe the neighbors with chocolate cupcakes? Plus, for a white kid reading these books, I'm not sure how clearly the message comes across of just how rude and insensitive such comments can be. 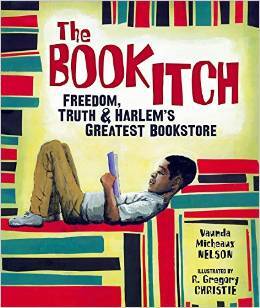 The Book Itch: Freedom, Truth, and Harlem's Greatest Bookstore (2015) by Vaunda Micheaux Nelson and illustrated by R. Gregory Christie. I had not heard of the National Memorial African Bookstore before and love books about the power and importance of books and libraries. This book, however, became much more about Malcolm X than the book store, per se. It is a bit wordy as well. 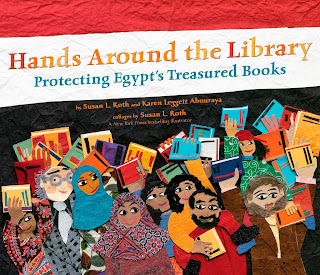 Hands Around the Library: protecting Egypt's treasured books (2012) by Susan L. Roth and Karen Leggett Abouraya and illustrated by Susan L. Roth. This book is also based on a true story about a library - protecting the modern library of Alexandria during the Egyptian revolution in 2011. In this fairly straight-forward retelling, the importance of the library is conveyed along with the actions of protesters to form a human chain around the library. Reminiscent of Alia's actions documented in The Librarian of Basra, this story reminds us of the fragility of books and resources in times of conflict and unrest. I actually enjoyed Chocolate Me when I purchased it ages ago. I'll have to have another look at it today. It is part of our celebrate diversity collection. It certainly celebrates, but I'm not sure it offers more beyond that. Would be curious what you think if you do revisit it. Interesting assortment of books. I haven't heard of this one by Seeger but my students enjoy her books. Here is what I read last week. Happy reading! Thanks, Kathy. I do think her books are more interesting when you first see one. That's quite a variety of picture books. I would like to read Hands Around the Library. I love the title of The Book Itch, too. Sounds like a bit of a hit and miss week with books. Chocolate Me was actually a bit confusing for some of the kids I shared it with - they had decided upon looking at the cover that the boy was actually made of chocolate, so the story was very confusing for them from this perspective! I could totally see that being a problem for younger readers. Thanks for sharing the anecdote, Jane! I like the book-themed books you shared here - particularly the Hands Around the Library - which I haven't heard of at all - and I think I've shared quite a number of versions of the Librarian of Basra in my higher degree classes - I just searched our library database, we do have it in our public libraries so will probably reserve it. Thanks so much for sharing. You're welcome, Myra! I often share Jeanne Winter's version of the Librarian of Basra with my students too. This would make a good companion, for sure. These look like some great books for my homeschool - especially as we've been studying MLK Day this week! I'm glad I found your hashtag. We'd love for you to link up with us at #LMMLinkup.